With today’s enterprises rapidly adding new communication channels, customer engagement has become multi-faceted and more challenging to get right. It’s not enough to deliver a multichannel or cross-channel customer experience. A unified omnichannel customer engagement strategy is necessary to provide customers with seamless journeys across every channel. 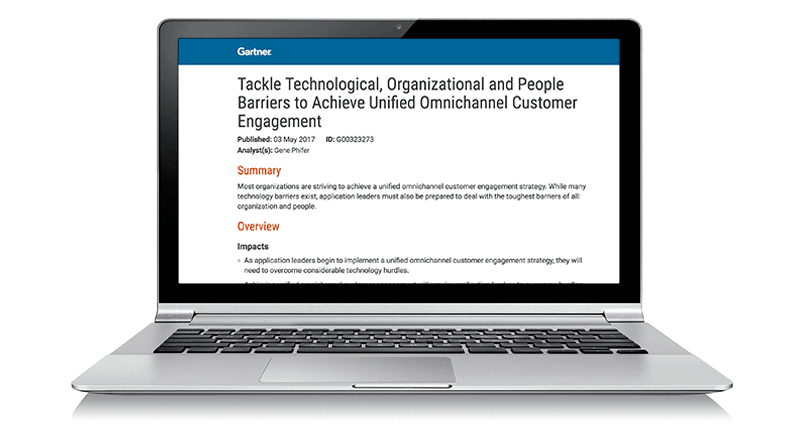 Through 2020, more than 25% of enterprises seeking to achieve unified omnichannel customer engagement will encounter irreconcilable people, political or organizational issues. While most enterprises are working towards achieving a unified omnichannel customer engagement strategy, there are significant hurdles to overcome. Yet, moving from a disconnected customer experience to one that that is truly unified is an important step to maintain a competitive edge. How to effectively use communication, collaboration, influencing and governance techniques to overcome barriers and deliver a true omnichannel customer experience.